Score a GREAT DEAL on the Paw Patrol Marshalls EMT Truck Vehicle and Figure today for only $11.49 (was $19.99) from Amazon! You will get FREE Shipping if you are a Prime member! Checkout more of the best Amazon prime deals we’ve found.If you are not an Amazon Prime member you can grab a FREE 30-Day Trial HERE! Get all of the Deal Details BELOW! 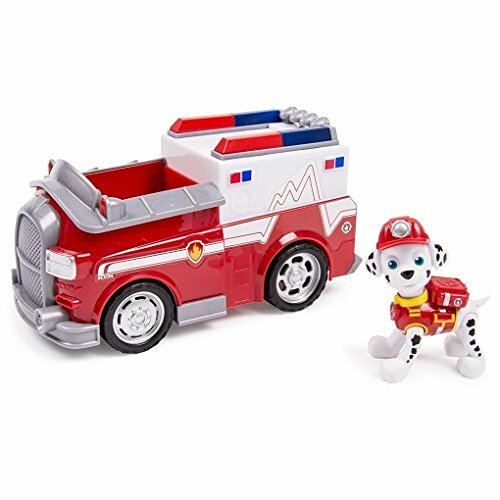 The Paw Patrol Marshalls emt truck vehicle and figure are made for kids ages 3+. No job is too big and no pup is too small. Now kids can reenact new rescue scenes with EMT Marshall and his new EMT Ambulance vehicle. All of your favorite Paw Patrol characters are ready to save the day. Race to the ruff-ruff rescue with EMT Marshall.Together, your child’s imagination will be lit up with pup-inspired rescue missions full of friendship, teamwork and bravery. With EMT Marshall Pup and EMT Ambulance you can save the day. Recreate your favorite Paw Patrol adventures with the new Paw Patrol marshalls EMT truck vehicle and figure. Pup and ambulance!! so cute! Don’t miss this deal at Amazon Today on the Paw Patrol Marshalls EMT Truck Vehicle and Figure for only $11.49 (was $19.99) ! Checkout more of the best Amazon deals we’ve found. Previous Post: Walgreens Black Friday Ad 2018 ~ BROWSE the Ad for 11/22 to 11/24/18 Next Post: AWESOME DEAL! KidKraft Austin Toy Box ONLY $57.99!